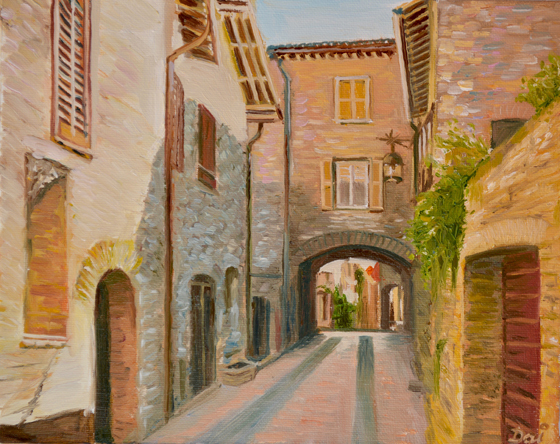 A vicolo (passageway) in the hilltop village of Assisi in the province of Perugia, Italy. Although throngs of tourists visit the nearby basilica of St Francis of Assisi, there are many quiet streets, alleys and passageways through beautiful stone and brick buildings which glow in the afternoon sun. Oil painting by Dai Wynn on canvas panel. 20.3 cm high by 25.4 cm wide by 0.3 cm deep approximately. FOR SALE. 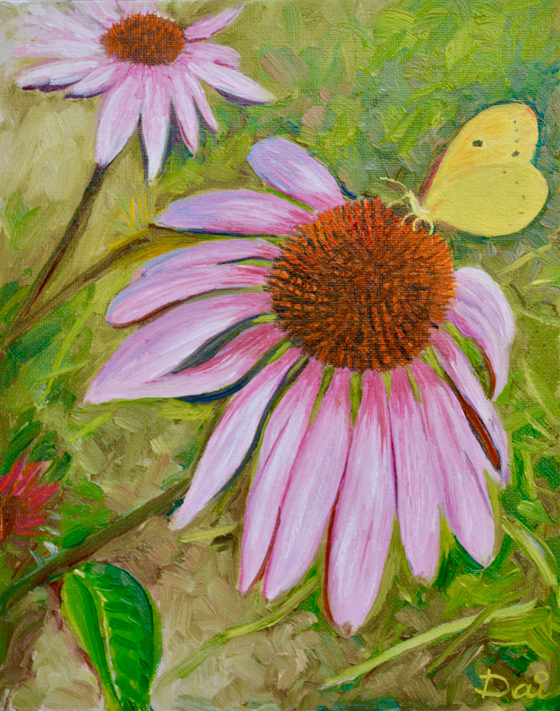 A butterfly sits on an echinacea (coneflower) in the Parco Giardino Sigurtà just south of Lake Garda in the Veneto region of northern Italy. Oil painting by Dai Wynn on canvas panel. 25.4 cm high by 20.3 cm wide approximately. 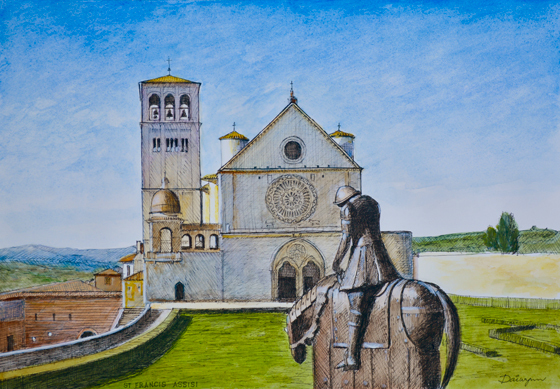 A bronze statue of St Francis in full armour on horseback before the Upper Basilica in Assisi, Italy. It is understood that, in 1204, God told him to return from the war to look after his people. Watercolours over freehand pen and ink drawing by Dai Wynn on 300gsm smooth Arches paper. 29.5 cm high by 42 cm wide by 0.1 cm deep. A3 standard size. 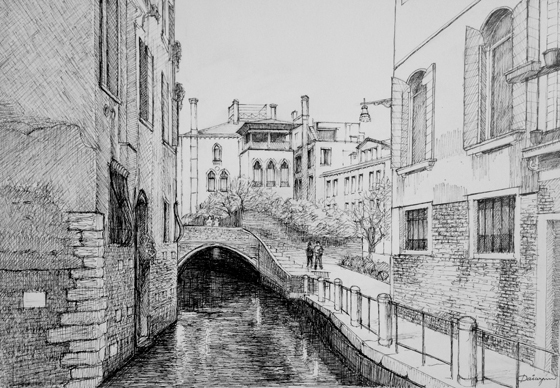 Freehand pen and ink sketch by Dai Wynn of a small canal in Venice, Italy. Drawn on smooth surface 300gsm Arches cotton paper using a 0.2mm fine line pen. 29.5 cm high by 42 cm wide by 0.1 cm deep approximately. A3 standard size. 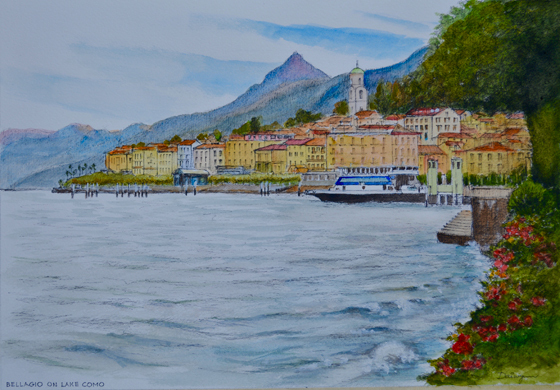 Ink and watercolour painting by Dai Wynn of the town of Bellagio on Lake Como in Lombardy, Northern Italy. Painted on 300gsm Arches cotton paper. 29.5 cm high by 42 cm wide by 0.1 cm deep approximately. A3 standard size. Calle Larga de la Donzela, Venezia, Italy. I have painted this charming scene a couple of times previously, but in watercolours. Oil painting by Dai Wynn on canvas panel. 25.4 cm high by 20.32 cm wide by 0.3 cm deep approximately. (10 inches by 8 inches). 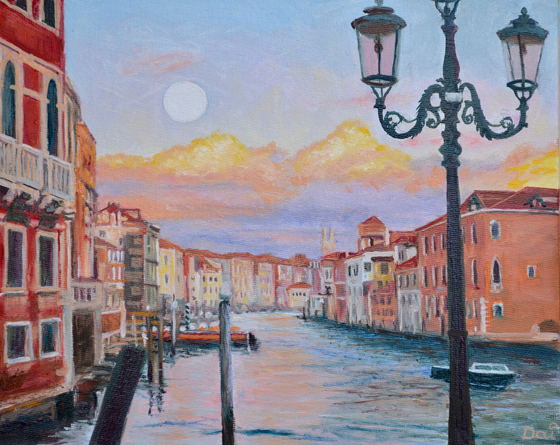 As evening falls over the Grand Canal in Venezia, and the setting sun lights approaching storm clouds with dramatic pink, orange and gold hues, a full moon rises in the east. 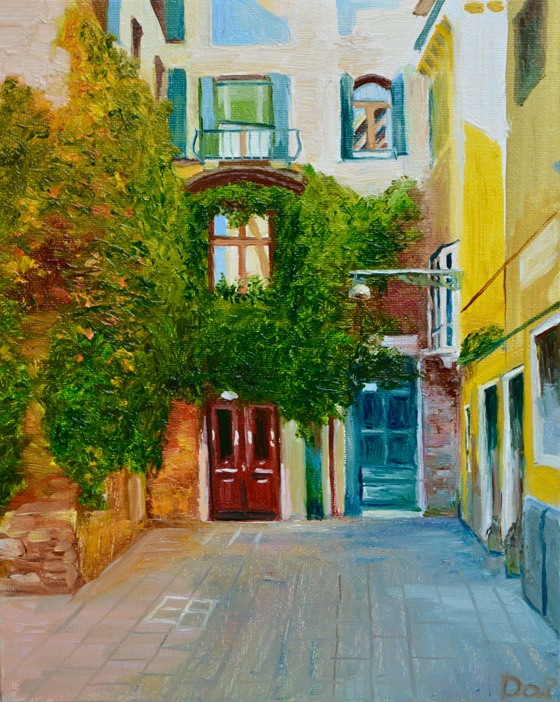 Painting by Dai Wynn in oils on canvas panel. 20.3 cm high by 25.4 cm wide by 0.3 cm deep approximately. (8 inches by 10 inches).